When the United States declared war on Germany in April 1917, to say the US Army was unprepared would be a gross understatement. The US had not trained and equipped a mass army since the end of the Civil War a half century earlier. The soldiers it did have were little more than a frontier constabulary force, with no combat experience since fighting the Spanish 20 years earlier or chasing Mexican bandits through the desert Southwest. Yet within 18 months, America had mobilized and sent almost 2,000,000 doughboys into the killing fields of France where these men quickly and ferociously learned how to fight and survive on a highly lethal battlefield against an experienced and unforgiving foe. The story of the “Lost Battalion” is one of the great legends of the so-called Great War, and this new volume, written by a foremost historian of World War I, presents this tale in a new way by stripping away the legend to expose the more intriguing tale underneath. Interweaving the stories of Major Charles Whittlesey, Captain George McMurtry, Sergeant Alvin York, and Damon Runyon, a reporter who became one of the early war correspondents of the American press, the author almost tells a coming of age story of early 20th century America, a time of lost innocence as Americans realized their oceanic moat could no longer isolate them from Europe’s problems. Each of these men came to the Argonne by a very different route, and each of them dealt with the effects of their combat experience very differently. Whittlesey and McMurtry were successful businessmen—the social and economic elite of New York City who felt compelled to answer their country’s call to serve as Army officers. York was a hard-bitten back woodsman who had deep religious convictions and struggled between his duty to God and country. Runyon was a hard drinking, womanizing sports reporter who just happened to be in the right place to cover the Pancho Villa raids into the southwestern United States in 1916 that launched both his and General John J. Pershing’s careers. When all of these men ended up in France in mid-1918, they were part of a growing American Army that was eager for combat, but completely unprepared for the vicious fighting that would occur in the fall of 1918. The Americans were grossly undertrained and had minimal experience surviving a modern mechanized battlefield that featured machine guns, chemical weapons, and heavy artillery. When the Meuse-Argonne offensive began in September, Americans got their first taste of what would be nearly three months of continuous combat that would cause over 100,000 American casualties. When Whittlesey and McMurtry led their men into the Argonne on October 2, 1918, they quickly moved into the treacherous terrain and moved out ahead of the rest of their regiment and division. Moving through a ravine, their unit was halted by German resistance and settled into a low ridge to wait for reinforcement from the rest of their unit. However, the Germans were able to surround and isolate the battalion which was cut off and “lost” for the next five days, holding out against continuous artillery, machine gun, and rifle fire as the Germans made repeated assaults on the battalion, exhausting their supply of food and water and nearly running out of ammunition. Due to the stalwart effort, or supreme stubbornness, of Wittlesey and McMurtry and the bravery of all the officers and men, the battalion was relieved after suffering nearly 70% casualties, with only 194 soldiers out of 554 able to walk off the battlefield. But Lengel doesn’t end the story here. The real impact of this book is the description of the postwar aftermath for these men as a microcosm of what happened to many World War I veterans. All of these men were deeply affected by what they saw and did during their time in combat, and in an era when post-traumatic stress disorder was not recognized or even really acknowledged, they all bore their trauma in different ways, and each of them in large part fought their psychological demons alone. Wittlesey is the real tragic figure of the book. Even though both he and McMurtry were awarded the Medal of Honor for their actions during those five days, he is haunted by the death and suffering of his men, many of whom unfairly blame him for not attempting a retreat in the face of overwhelming German force, an action that likely would have led to the annihilation of the battalion. Wittlesey is never really able to gain his footing after the war as his suffering and guilt haunt him and his life is cut short by his tragic death in 1921. 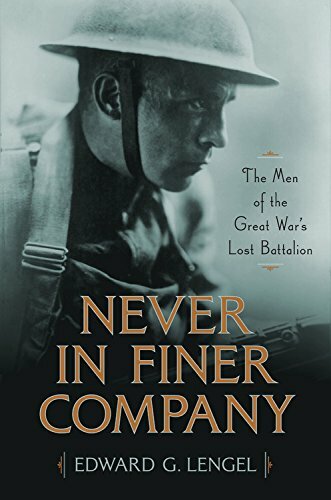 McMurtry, York, and Runyon tried to resume their own lives with varied degrees of success as they dealt with their own trauma from the war, and when the book ends, the reader is left with a tale of bravery, courage, and sacrifice, tempered with the knowledge that these men carried their burdens of loss, terror, and guilt far beyond the Meuse-Argonne forest.